For a band that is credited with launching so many genres (industrial, electronic post-punk, techno, etc.) Cabaret Voltaire are singularly underrated, both for their avant-garde credentials and for the fact their output, especially during their 1978 to 1985 heyday, contained some of the most engaging, thought-provoking and exciting twists on pop ever to surge out of the post-punk maelstrom. It’s hardly surprising therefore that the solo works of the Cabs’ members have equally passed somewhat under the radar. In fairness, singer-bassist Stephen Mallinder only ever released one solo album whilst electronics whizz Chris Watson has made a name for himself in the world of field recordings. Which leaves former guitarist, clarinettist and all-round experimental multi-instrumentalist Richard H. Kirk as the most prolific solo Cab, with a wealth of albums and other releases to his name or pseudonyms. Given that much of his work under his own name carries the spirit of Cabaret Voltaire very firmly in its heart (Sandoz is a different matter, but more of that later), it’s nice to see him getting such an exhaustive reissue treatment as he does on these box sets. 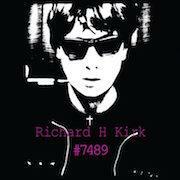 Richard H. Kirk’s debut album, Disposable Half-Truths, was released in 1980, at the height of Cabaret Voltaire’s seminal first, Chris Watson phase (for neophytes, after Watson left the band lurched towards dance music with fewer experimental or noise flourishes). Anyone questioning the Cabs’ right to be uttered under the same breath as Throbbing Gristle might want to note that Disposable Half-Truths, like many an early Cabs release, came out on TG’s Industrial Records, and much of it sounds somewhat indebted to both Kirk’s parent band and the ‘Wreckers of Civilisation’. Tracks like ‘Synesthesia’, ‘Amnesiac Disassociation’ or the lengthy ‘Outburst’ feature familiar snarls of warped guitar, disembodied, tortured vocal samples and synths driven solidly into the red, creating an overbearing atmosphere of dread, only partially lightened by hesitant drum machine shuffles. Ever a politically-minded individual (interviews with him are worth tracking down, especially as the politics is elliptical in his music), the angry industrial punk of Disposable Half-Truths is haunted by the spectre of the Cold War and unpredictable technological advances, and the results come close to the morose majesty of Cabaret Voltaire’s masterpiece Red Mecca, although it lacks that album’s focus. Still, the shuddering percussive lurch, distorted Alan Vega-esque vocals and abused clarinet of ‘Information Therapy’ will be a joy for any Cabs fan. Kirk’s solo vision wouldn’t properly take its own form until 1983’s Time High Fiction, which remains the best album across the two box sets. Like most of the releases in these boxes, it’s a lengthy, daunting work (a clear sign we were entering the digital age by this point) but it’s also powerfully coherent. Whilst Kirk was already exploring the realms of dance, proto-techno and even hip-hop by this point, as evidenced by the two compilation/outtake CDs (one of them the previously-issued double set Earlier/Later) that round off #7489, on Time High Fiction he takes the template laid down by the industrial pioneers and pushes it into the ether. There’s still enough of the mauled guitar lines and minimal percussion to keep the Cabs connection in mind, whilst the artwork throws out oblique references to the 1917 Russian revolution and activist marches leaving from Charing Cross, but Kirk’s use of synths is more expansive and enveloping, such as on the phantomatic ‘Force of Habit’ with its nocturnal voices, spindly guitar solos and almost funky bass. ‘Black Honeymoon’ is a corking thump, a driving post-punk salvo, whilst ‘Wiretrap’ positively seethes with disjointed rhythmic unease and haunted electronics, like an armada of ghosts waking up in robotic shells and deciding to go on the warpath. Paranoia and violence, the thematic hallmarks of great Cabaret Voltaire releases The Voice of America, The Mix-Up, Red Mecca and Three Mantras, abound on Time High Fiction, exemplified by the two lengthy parts of ‘Dead Relatives’, a colossal collage worthy of Nurse with Wound. By 1986’s Black Jesus Voice, Kirk was enthralled by the hard-hitting sounds emerging from America’s hip-hop scene, and the album is rhythmically indebted to the likes of Run DMC, Afrika Bambaataa and Public Enemy. Black Jesus Voice heralds a warmer sound than that of Time High Fiction, with funky bass and reverbed drums, but lacks the edge of Kirk’s earlier work, meaning its impact is lesser and, truth be told, whilst tracks like ‘Boom Shala’ and ‘This is the H-Bomb Sound’ probably tapped into the nascent acid house culture of the late eighties and had club-goers of the time shaking their booties, in 2016 it all sounds a bit dated. The exception is the dark, angular and abrasive ‘Martyrs of Palestine’ which, with its chugging guitar riff, mangled vocals and insistent rhythmic stomp sounds like an updated rendition of Cabs classic ‘Nag Nag Nag’. Released around the same time as Black Jesus Voice, Ugly Spirit is often seen as a companion album to its predecessor, yet its sound is markedly different. ‘The Emperor’ features shimmering synths, languid percussion and a japanese voice repeating the title in a mysterious loop. Rather than hip-hop of club music, on Ugly Spirit Kirk appears to be inspired by Eno and Byrne’s My Life in the Bush of Ghosts. It may not quite be on the same level as that masterpiece, but it remains the most forward-looking of Kirk’s solo albums of the eighties, and a true experimental gem of the period. The last two CDs in the box set are, as I mentioned, collections of outtakes, extended versions and archival material and, as is often the case on such compilations, the quality varies wildly but at least both hint at where Richard H. Kirk was headed after Ugly Spirit: he immersed himself more fully into nineties dance music, joining Warp Records, with mixed results. This retrospective reasserts his solo work of the eighties as a beguiling shadow of what Cabaret Voltaire and their ilk were up to, and takes a shadowy walk through the strange underworld of a strange decade. When it comes to Sandoz, I’m afraid I have less to say: much as I have listened to the four CDs of #9294 on repeat for the past three weeks and was encouraged to discover that Kirk’s early releases under the moniker came out on the esteemed Touch Music label, it’s impossible to shake the reality that these albums haven’t aged all that well. Kirk’s natural sense of rhythm remains intact, sometimes veering into the seductive, hypnotic ambient techno style so masterfully perfected by Porter Ricks and Fluxion, but more often than not the hyper-smooth synths, chiming bell sounds and nods to African or Asian traditional music feel a bit pap and, well, nineties. Fair enough, the four CDs cover the years 92 to 94, but compared to, say, Basic Channel or Boards of Canada’s music of the period, or even the best Chemical Brothers or Leftfield singles, it’s all a bit synthetic and aimless, even at times, notably on debut Digital Life Forms, lurching dangerously close to Future Sound of London territory. I would heartily recommend the Richard H. Kirk boxset, because it gives his mysterious, arcane and uncompromising music made in parallel to Cabaret Voltaire’s a long-overdue moment in the sun. The crossovers are never such that you think you might as well be listening to the Cabs, and in Ugly Spirit he released a true enigma of a record unlike much that was around at the time. As for #9294, if you’re a DJ looking for eminently samplable material or a fanatical ambient/dub techno fan, then Sandoz is for you. It’s by no means poor music (some tracks are borderline superb), but if you want truly original music that will linger in the dark recesses of your soul, #7489 is pretty much required listening.